Not sure of all the vape terminology and definitions? Then check out our complete vaping glossary! Vaping is constantly evolving with new technology and methods. 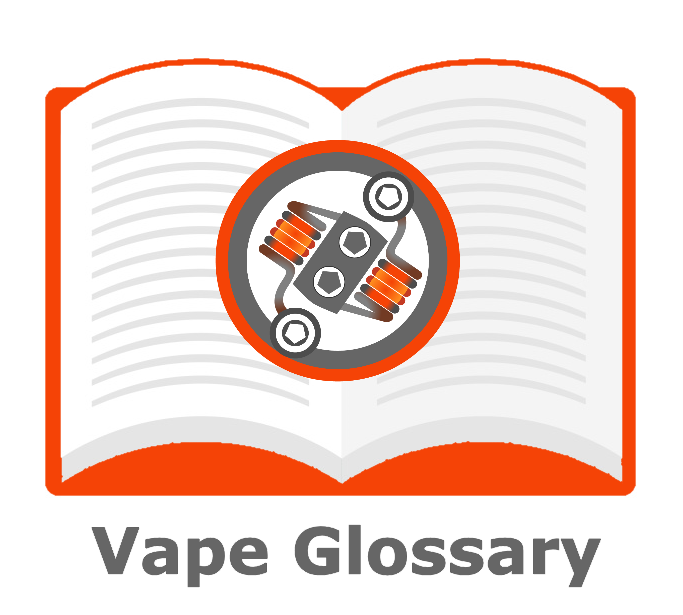 We will constantly be updating this vaping glossary with any relevant terms and names. If you see something which you think should be added to our vaping glossary, then please comment below! We want vapers to have a complete understanding of what vaping is and how they can utilize different vaping technology. Ω – The ohm (symbol: Ω) is the SI derived unit of electrical resistance. In vaping the Ohm symbol will refer to the resistance of your coil or atomizer. 26650 – One of the biggest removable batteries commonly used in mods and vaporizers. 510 – This is the most common threading on atomizers, tanks, and clearomizers. 18650 – This is the most popular sized removable battery in vape mods and e-cigarettes. Airflow – With more advanced tanks you’ll be able to adjust your airflow to control the amount of air you inhale. Loose airflow means more vapor; tight airflow equals less vapor but better flavor. All Day Vape – Your favorite e-juice or e-liquid that you vape all day. Amps – Short for amperage. Batteries with higher amps are better for lower resistant coils. Analog – Slang for traditional cigarettes. Automatic – These are a variety of e-cigarette that doesn't have a fire button. When you inhale the device fires automatically. Automatic Shutoff – This is a safety feature of most e-cigarettes and vaporizers. It prevents over-firing and is normally set at 10 seconds. Battery – This is what powers your vaporizer or e-cig. It will either have an internal removable battery or an internal battery that is non-removable. Battery Wrap – This is the plastic coating around your battery and prevents dangerous shorts. Never use a battery with a damaged battery wrap. Bottles – This is what your e-liquid or e-juice is purchased in. They will either be plastic squeeze bottles or glass drip style bottles. Box Mod – A powerful vaporizer product that features removable batteries. They range from 50W – 300W in power. Clouds – This is your vapor! Look out for some massive clouds! Coil – This is the heating element inside your tank or atomizer. They are available in different resistances, and it’s advised to stick to the brand of your tank. Connection – This is how the tank and mod connect. It will be a 510-thread connection in almost all vaporizers. Cutoff – This is a safety feature of most e-cigarettes and vaporizers. It prevents over-firing and is normally set at 10 seconds. Deck or Build Deck – This is part of your atomizer where the positive and negative posts are located. The bigger the deck, the easier it will be to rebuild or build coils on. Draw – The act of inhaling or drawing on your vaporizer or e-cigarette. Drip (Dripping) – This is when you drip e-liquid directly onto a coil in a Rebuildable Dripping Atomizer or RDA. Drip Tip – This is the small mouthpiece on your tank. You can use custom drip tips to create your own unique look. Drip Well – The bowl shape near your e-cigarettes connector. Helps to catch leaking e-liquid. Dry Burn – Burning off any dried e-liquid on your coil by firing without adding e-liquid. Dry Hit – When you inhale on your vaporizer without enough e-liquid. eGo – One of the most popular ranges of beginner e-cigarette kits. E-Juice or E-Liquid – This is the liquid you use in your vaporizer or e-cigarette. It contains nicotine, Propylene Glycol, Vegetable Glycerin, and flavoring. E-Cigarette or E-Cig – This is the basic electronic cigarette. More advanced e-cigarettes are called Vaporizers or Mods. Flavors – This is what your e-juice is flavored. There are thousands of different flavors to choose from. Some of the popular flavors are desserts, candy, fruits, drinks, and tobacco. Flooding – When you draw too much e-liquid into your coil. FDA – The administrative branch of the United States that controls food and drug safety. Gunk – The residue which accumulates inside your tank, atomizer, and coil. Too much gunk can reduce the effectiveness of your coil to heat e-liquid. High Resistance – A coil or atomizer with a high Ohm reading. Good for high voltage vaping. High VG – An e-liquid with a high VG or Vegetable Glycerin ratio. Great for vapor production and high-end or powerful vaporizers. Inhale – When you draw back and inhale vapor from your e-cigarette. Juice – Another name for e-liquid or e-juice. Kanthal – The most popular wire for building coils. Kick – The term used to describe the throat hit from inhaling the vapor. Leaking or Leaks – When e-liquid leaks out of your atomizer or tank. Usually caused by faulty coils, incorrect coils, or damaged seals. LED – Stands for Light Emitting Diode. LEDs are used in warning lights on e-cigarettes. Liquid – Another name for e-liquid or e-juice. LR or Low Resistance – Coils with lower resistance, usually 1.5 Ohms or lower. mAh – An abbreviation of milliampere-hour, this is the term used to describe a battery’s capacity to store energy. The higher the mAh, the longer its life the battery has before needing to be recharged. Manual – An e-cigarette or vaporizer with a manual fire button. Mechanical Mod or Mech Mod – These mods don’t have any wires or chips. These are recommended for experienced vapers only as they contain no safety features. MG – Milligram strength per Milliliter. This is how much nicotine is in your e-liquid. Mini – A small or stealthy e-cigarette. ML – Stands for Milliliter. The amount of e-liquid in your bottle or how much capacity your tank or atomizer has. Mouthpiece – This is where you inhale the vapor from your e-cigarette or vaporizer. Mouth-to-Lung Hit – Inhaling directly into your lungs. Less vapor, but better flavor. Nicotine – This is the substance found in some e-liquids and traditional cigarettes. Nicotine can be poisonous, use caution when handling. Nichrome – A wire used to build coils. It heats up faster than Kanthal. Nickel – This wire is used in coil construction and is the fastest to heat up. It is vulnerable to melting if overheated. Ohm – Symbol: Ω. The unit of measurement used for electrical resistance. Organic Cotton – A type of wicking made from Organic Cotton. Popular in rebuildable atomizers. Burns faster than silica wicking, but offers better vapor production and flavor. Parallel – When mods that can use two batteries are wired in parallel, this gives increased battery life, effectively doubling the mAh. Pass-Through – When you can charge your e-cigarette or vaporizer and vape at the same time. Pen Style – A tube or pen-shaped vaporizer or e-cigarette. Personal Vaporize or PV – Another name for e-cigarettes. Propylene Glycol or PG – One of the main ingredients in e-juice or e-liquid. Priming – Allowing time for e-liquid to soak into the wicking on the coil before firing. Rebuildable – These are tanks or atomizers that allow users to rebuild their own coils and wick. Better suited to advanced vapers. RDA – The abbreviation for Rebuildable Dripping Atomizer. RBA – The abbreviation for Rebuildable Atomizer. RTA – The abbreviation for Rebuildable Tank Atomizer. Series – This is mods that have dual battery setups. The batteries are wired in a series. Stainless Steel – A type of wire used in coils. Good for Wattage Mode or Temperature Control Modes. Starter Kits – A vaporizer or e-cigarette perfect for beginner vapers. Steeping – The process which allows your e-juice flavors to settle. Mostly for DIY e-liquids, some purchased e-liquids will require steeping, some will not. Sub-Ohming – This is for experienced vapers. This is when you vape with coils below 1.0 Ohms. Tank – This is the part of your e-cigarette which holds your e-liquid, atomizer, or coils. Temperature Control or Temp Control – This is a setting on advanced vaporizers. It uses coils with Nickle, Titanium, or Stainless-Steel wire. The device recognizes the coil and sets itself accordingly. Throat Hit – This is the sensation after you inhale the vapor. The higher the PG, the bigger the throat hit will be. Titanium – A wire used in coil construction. It heats up and cools down quickly. Great for Temperature Control mods. USB Charger – Some mods allow vapers to charge the batteries via USB without having to remove the batteries and charge separately. USB charging is slower than removing the battery and charging in a battery charger. Vape or Vaping – The act of using an electronic cigarette or e-cig. Vape Juice – Another name for e-liquid or e-juice. Vaper’s Tongue – The loss of taste. Often due to illness or vaping with one flavor profile too much. Vegetable Glycerin or VG – An ingredient in e-liquid. It has a sweet taste and is thicker than PG. VG is responsible for the vapor production. Higher VG e-juices produce more vapor clouds. VV or Variable Voltage – Any type of e-cig that allows users to adjust its voltage output according to taste, it is considered superior to regular devices that have static voltage outputs. VW or Variable Wattage – Devices which use VW allow users to adjust the wattage output of their device. Wick – The cotton inside your atomizer or coil that allows the e-liquid or e-juice to soak into. Wire – This is the term for the material used to build the heating element inside your coil. Wrap – This refers to the number of revolutions used in the wrapping of a coil.